Glass vinyl application is commonly used to display a store’s name/logo, business hours, and current promotions. Maximize the window space of your business to further help reach your audience, and to build your clientele with vinyl! Click HERE to watch the video of Jett breaking down the entire application process. Rapid Tac Application Fluid works as a cleaning solution to prep the glass, further helping prep a clean glass surface for your vinyl stickers. This fluid gives just enough slide to float your vinyl into the correct position before you squeegee it into place, where as other fluids may become sticky or dry too quickly. Remove liquid and air bubbles from your design using the soft edge first, and then the hard edge to allow the vinyl to properly adhere. You always want to use your squeegee at a 45 degree angle to keep equal pressure throughout the squeegee blade and to get an even placement of your design. Be sure to watch the video! If you have any questions or comments leave them on YouTube. Vinyl car wrapping will continue to be a major trend for 2017 and we’re here to help you learn how to do it. Whether it’s a vehicle used to market your business, or your own personal vehicle that you’d like to freshen up; vinyl is the way to go! Vinyl car wrapping progressed mainly for advertisement purposes, but now a lot of people are choosing to wrap their cars, rather than repaint. Avery is the leader of modern, advanced adhesive vinyl; ranging in many different colors and finishes (chrome, matte, semi-gloss). Some may be thinking about the stickers that they tried putting on their cars years ago. Trying to get the right placement, remove air bubbles and to get a smooth finish takes skill. The techniques used to wrap a car still take practice and require some skill, but it’s now easier than ever before thanks to the adhesive technology. Avery’s adhesive technology allows you to reposition, stretch and mold the vinyl before it fully adheres at around 24 hours. This type of “cast” vinyl has channels allowing the air and bubble to escape; leaving you with a smooth finish for up to 10 years. All vinyl rolls can be stretched by 40% to allow wrapping around bumpers, curves and edges. Step 1: Choose your desired vinyl. At Mclogan Supply we sell 60 inch x 25 yards of color changing vinyl rolls, in 50 different colors. 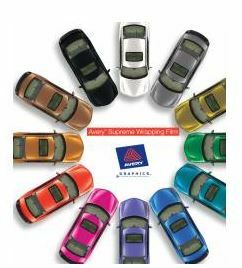 Usually one basic color roll will cost you around $550 and that will cover most cars fully. Since this is just a single color change, anyone can do it. You don’t have to worry about a design or printing. In some cases, our customers just need a specific area of their vehicle color changed and we then sell the vinyl by the yard. Step 2: Thoroughly clean the car and make sure it’s dust free. Removing mirrors and molding makes for a smoother vinyl wrap and usually takes less time over all. Any type of dent, deep scratch, or dead bug will show up under your vinyl, so be sure to get the car as clean and smooth as possible. Step 3: Map out where you want to start vinyl wrapping. Some prefer to start with the bumpers, because they take some time to stretch and mold the vinyl. Other people start with the hood of the car, like you can see on our YouTube video posted here. Once you know where you’re going to start, use a Mclogan Utility Knife to cut your vinyl into sections. These panels need to be pre-cut to cover the entire desired space as seamlessly as possible. Next, you will use Mclogan Wrapping Magnets to hold the vinyl in place as you remove the backing (just like a sticker). Step 4: Start sticking the vinyl panel onto your car, from the center out. If the vinyl doesn’t lay right/bubble just lift up the edge, pull and stretch, before you lay it back on. Using a Wetedge Squeegee here is key. This squeegee will allow you to stretch, mold and smooth the vinyl over the vehicles curves. Using a heat gun while stretching and molding the vinyl is also really helpful, especially for bumpers. Preheating and stretching the vinyl will help with the harder concave spaces. Step 5: Now that your vinyl has been pulled, stretched, heated and smoothed into place, you can now cut off the excess vinyl. Use your Mclogan Utility Knife to carefully cut away and peel. Be sure to use a light hand when cutting, to ensure that you are not scratching the paint beneath the vinyl. Remember to reapply the cut edges with 3M Primer 94 to prevent peeling! A good tip is to not forget to use Primer 94 under your hood, attaching the vinyl to the hood. The hood seems to be a spot some people forget and over time it is known to peel away. After these 5 steps you are done! Take in your new looking vehicle and enjoy your labor! The best thing about vinyl is that your car paint is now protected from minor rocks, road trip dings, and fading from the sun. Your vinyl will last up to 10 years if you’re using Ducky Car Wrapping Vinyl Cleaner. We can’t wait to see your next vinyl project, so be sure to #mclogansupply on Facebook and Instagram. As always, call us with any questions. Are the new performance and stretch fabrics giving you print nightmares? Simplify your printing process with International Coatings’ 7100 Performance Pro Series inks. Performance Pro™ was designed to print on 100% polyester or poly-stretch combination fabrics and can be used on automatic and manual printers. International Coatings’ new 7100 Performance Pro™ Series allows printers to print on a variety of todays’ popular performance fabrics, including 100% Polyester, Poly-blends, moisture management, and stretch fabrics. 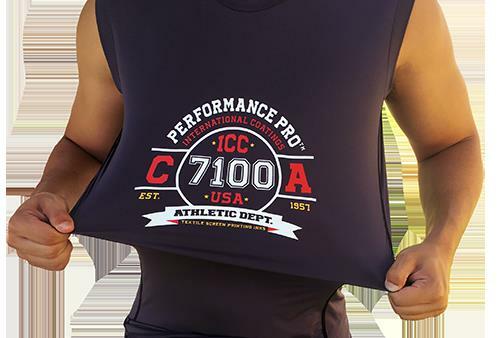 7100 Performance Pro inks have a built-in bleed blocker as well as extra stretch properties, making them the perfect inks for those hard-to-print athletic, compression or wicking garments. 7100 Performance Pro comes in 18 colors as well as a mixing base. Performance Pro™ inks offer a smooth consistency for ease of printing on light or dark fabrics. For ultimate bleed blocking on highly volatile fabrics, use Performance Pro inks in conjunction with 7043 Guardian Gray™. for possible dye migration before beginning a production run. 7100 Series should be used straight from the container without any modifications. the bleed resistance, opacity and/or stretch. Use 60-305 t/in or 24-120 t/cm monofilament. range, for best results. Lower mesh counts recommended. 275°F to 300°F (140°C to 149°C) entire ink film. As always if you need help call one of our professionals today. 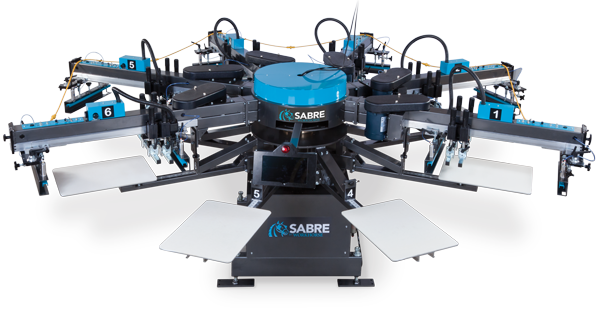 The Automatic Screen Printing Press is a machine that will automatically put the ink onto your garment and screen print it for you. 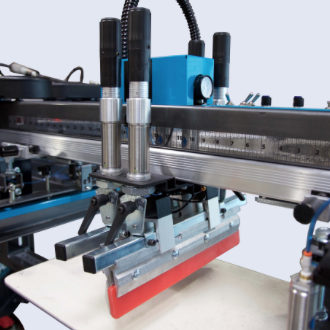 If you are newer to this type of equipment or newer to the business then it’s time to get familiar with all the wonderful, time-saving benefits that a Workhorse Automatic Screen Printing Press has to offer. 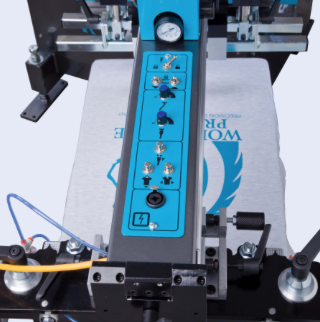 Just imagine with the push of a button and you can have a 6 color screen print done within 8 seconds; that’s 500 printed shirts within an hour! Aside from the clean, durable, accurate prints; think of all the money you could make if you properly managed your printing time per week or per job. Manual screen printing presses max out at about 45 shirts per hour and require the printer to do all the work. 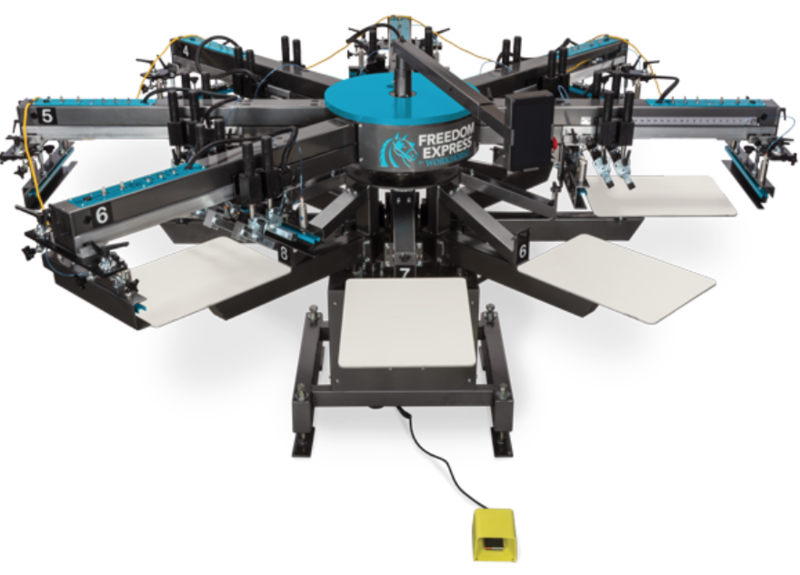 The automatic press that we are the most excited about is The Freedom Express. The name says it all! -Air Printheads and Air Indexing with air driven printheads it’s easy to independently alter print/flood speeds for your needs. -Overall Diameter of 10′ is the perfect size for all different business. Whether you are in a studio, garage or your own store this machine takes up just enough space to allow it to do the job. 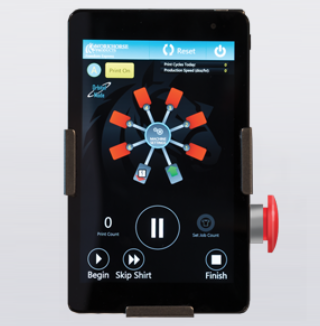 -Touchscreen Interface Technology with a test mode for sample prints, a missed shirt feature, and an orbital mode. -Flashback Compatibility to print, flash and cool all at one station! -Central Off-Contact Feature allow printers to easily change between different substrates quickly. -Squeegee/Floodbar Settings to allow you to leave the screen flooded or clear. All angle, pressure and speed adjustments are independently set for the look of your job. -All Access Control Panel can be rotated to any station for easy access to the whole computer of the machine. Come visit us in Anaheim to see these machines in action and to test out their endless capabilities. As always we look forward to seeing you and to help you achieve your screen printing goals! Use promo code MCL7417 at checkout to save. Offer valid for supplies only. Excludes equipment. Everyday we get the question what Roland Printer is right for my business? In about 3 questions we can answer this question. 1. What type of printing are you looking to do? Vehicle wraps, banners, heat transfers, fine art, ETC. 2. What speed are you looking for? When a new business is starting out speed is not a huge factor because they don’t have that large customer base. The slower print speed is okay and it saves them money with allows to buy that extra piece of equipment that may be needed. 3. Space? We always want to make sure that you have enough space in the facility where your putting your printer. BN-20 packs everything into one, powerful, profit-producing package. With award-winning eco-solvent inks including metallic and white options, a range of material compatibility and integrated contour cutting, the BN-20 is easily the most versatile print device in its class. The BN-20 is perfect for creating t-shirt graphics, poster prints, stickers and decals – all from the comfort of your desktop. XR-640 large format printer/cutter with metallic and white ink delivers maximum versatility and productivity with unsurpassed image quality. 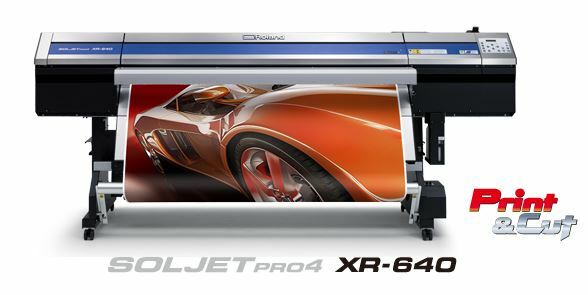 Thousands of print service providers have built their business on the XR-640, with the ability to produce everything from banners, vehicle wraps and fine art to print/cut labels, decals, point-of-purchase displays and so much more. The two printers below are great for doing banners ,vehicle wraps and or businesses that are larger and already have vinyl cutters. VersaEXPRESS RF-640 is a large-format inkjet printer the smart choice for your business. Efficient, reliable and affordable, the VersaEXPRESS RF-640 delivers outstanding prints day in and day out. New EJ-640 large-format color printer has dual staggered print heads and a rigid new industrial design, productivity and quality are built in. So are big-time savings. The EJ-640 runs with new Roland DG EJ INK that costs up to 35% less than the competition. The result? High-volume, low-maintenance printing and bold, exciting colors with higher profit margins. Let Mclogan help you make the best printer choice for your business at one of our four locations. Watch this YouTube video explaining why white plastisol ink is essential for screen printing. In the video we will talk about the different plastisols you can use based on your screen printing job and ways in which to make printing with white ink easier. Learn these tips, tricks and techniques to help make your job run as smooth as possible. Four color process screen printing, also known CMYK printing (cyan, magenta, yellow and black) is the technique that screen printers use when printing a photorealistic image on a garment. This differs from a typical four color print, because in this technique the plastisols are laid on top of one another wet. This process creates a wide variety of colors and dimension. For this type of screen printing job we recommend using International Coatings Pro-Brite Process Colors. These plastisol inks provide a smooth, even print style. They are easy to manipulate whether you are printing with a manual or automatic screen printing press. Pro-Brite Process Inks are more opaque than the industry standard, yielding vibrant colors that make your print come to life. It’s beneficial to know when you are using a manual press that a sharp 80 durometer squeegee with light pressure is ideal. It’s best to keep the ink on the surface of the garment. Lighter pressure will ensure that the next color you print mixes evenly and accurately in the dot space. The automatic presses use a 75/95/75 triple durometer squeegee set at a 20 degree angle with light pressure. A faster stroke speed is also ideal for an automatic press. Knowing this type of press set up, along with quality artwork will reward you with a detailed, realistic, photo-like screen print. If you are newer to this process go into one of our stores today and let one of our knowledgeable associates help you. Be sure to stay up to date with more products like this by following our Instagram page and tune in on Friday’s to watch us work with products and techniques on Instagram Live. Watch our latest YouTube Video to help you determine the best exposure time by doing a step wedge. Once you’ve determined what emulsion you’ll be using you can ask a McLogan employee what the exposure time could be. This answer varies based on the exposure bulb you’re using and the distance from the bulb to the screen. Once you have a close estimate for exposure time, you can do time increments around your estimated time to test it out. Using the step-wedge allows you to do this once, only messing up one screen and giving you your best exposure time for screens moving forward. Let us know that you like that video by leaving us a comment. If you have any questions call us today! We are so fortunate to help so many people get started in the screen printing industry. We go from watching these men and women have a love of art, creating and design; to then turning that love into a full blown thriving business. This blog is for those of you that have been wanting to start your own business, but who haven’t. You know, the timing isn’t quite right. You could possibly fail and then risk being rejected. Maybe you don’t honestly believe that you deserve success; it’s everyone else and just not meant for you. We get it, but let’s be honest and tell you that’s all a bunch of bullsh*t.
When you are passionate about what you are doing and living your purpose there’s no such thing as a failure. Sure, there will be many lessons along your journey, but you will fail foreword. You’ll become smarter and wiser from every challenge. It’s those time of challenge where we find our true potential. It’s when we realize how smart we are at problem solving; at learning and rising to overcome whatever obstacle. If you’ve been in your comfort zone wishing, and talking about a business you plan on starting; let today be that day. Feel the rush, excitement and aliveness within you and challenge that into succeeding. At the end of the day we rarely throughout our lives feel true failure, and rejection. On the contrary, if we look back over the years we will see that we’ve had endless teachers, mentors, and friends cheering us on and teaching us. For the maybe 5 plus times we may truly face rejection that hits our heart, there are thousands of complements, love and guidance trying to push us towards our true path. Let McLogan’s help you get started on your screen printing path. We are here to cheer you on!!! Here to offer tips, tricks and optimal products, so that success is guaranteed. As always it’s all of you living your dreams and shopping at our stores, that allows us to live our dreams of being the best screen printing and sign supply company. So thank you for supporting us and in turn we are ready to support you! We look forward to hearing from you and may this be the start of you living out your dreams.